Yaah! Magazine is a new kind of periodical. An independent digest that covers all types of war and strategy games, regardless of their publisher. 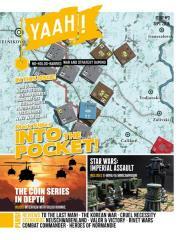 Also fun is the game and accompanying historical article that you’ll find in every issue. Not huge, these are strategy and war games that are playable on a 11” x 17” map with no more than a sheet of counters and eight pages of rules, something that you can play and enjoy in a single sitting.